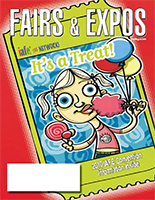 Published six times a year, Fairs & Expos magazine is the source for information on fair trends, innovative ideas, and association activities. The magazine is designed to assist members in sharing their successes and learning from the experiences of others. All members are encouraged to take advantage of the opportunity to showcase their achievements in Fairs & Expos. Current on-line editions of Fairs & Expos contain all the content from the print versions. Logged-in members can browse our latest issue or any past on-line edition. For more details on the content Fairs & Expos offers, subscriptions, advertising in the magazine, or submitting articles, click on the links above. As the IAFE grows, we want the magazine to grow with it. To do this, we need your help. Let us know what you think about Fairs & Expos. We want your opinions and your input for future changes. Contact our staff with any comments or suggestions.